NFL PAT proposal: A 43-yard extra point kick is a terrible idea. Here’s a better alternative. The 43-yard PAT kick is a terrible idea. Here’s a better alternative. 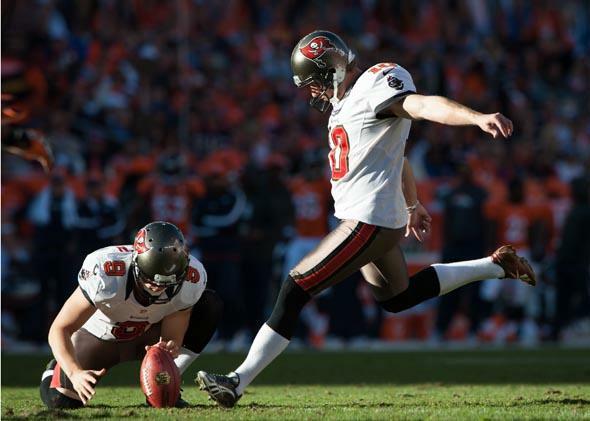 In the NFL, the extra point has become beside the point. Un-noteworthy, uninteresting, unpopular, and undramatic, the extra point is the parsley of sports. The Dermot Mulroney of sports. The Dermot Mulroney snacking on parsley while driving his Volvo station wagon through Manitoba of sports. A total of 1,267 extra points were attempted in the NFL last year, and 1,262 of those were made. The year before that: 1,235 attempted, 1,229 made. Last year, 27 full-time kickers did not miss one extra point. Extra points are clearly easier to convert than most pull-out sofas, and as such the league has begun to reconsider the point after touchdown (or the “point after try,” if you prefer the rule book nomenclature). One of the reform proposals, floated like so many leather spheroids from 20 yards away, is to have every touchdown be worth seven points. As Commissioner Roger Goodell explained in an interview with NFL Network’s Rich Eisen, teams could stand pat with that seven points or choose to attempt a two-point conversion. In practice, it would serve as a plus-or-minus-one-point conversion: If you succeed, your score goes up to eight, and if you fail, it decreases to six. This would have the weird effect of seeing points subtracted off the scoreboard, which doesn’t occur in too many sports outside of darts. It is, though, a pretty seamless way to eliminate the useless extra point without affecting any other aspects of game play. Now, Judy Battista of NFL.com is reporting that there’s an alternate proposal that would move the PAT attempt back to the 25-yard line, setting up a more difficult 43-yard try. Yes, this would bring PAT conversion percentages down—NFL kickers converted about 83 percent of their field goal attempts from between 40 and 49 yards in 2013. But no, this would not solve the PAT problem. The key to making extra points more exciting is not to guarantee that a few more are missed each year. What the NFL must do is stop having PATs be kicks at all. Please note, ye sons of Yepremian, I am not saying that all kicking should be eliminated. The field goal is so ingrained in football that fans know how to process it. At the end of a game, it is a moment of supreme drama; during a game, it is internalized as the consolation prize it is. If you asked most fans to quantify their excitement over field goals as compared to touchdowns, they’d probably say that they’re about 42.86 percent as exciting. And that is the right answer (three divided by seven). It also seems important that the lesser score is achieved in a different, and—as judged only against the values of football itself—lesser way. Football is tough, fast, painful, and brutal. Field goals are none of these things. Field goal kickers absolutely are performing a physical feat, and they should be respected for their craft and athleticism. But kicking the ball doesn’t really fit in with the essential gestalt of what football has become. I actually endorse the automatic seven-point proposal, with the, let’s call it a net-two-point conversion. But if the league wants a more revolutionary proposal, I’ve got one that’s more exciting than a 43-yard kick. The scoring team’s quarterback stands on the 50-yard line. Three of his receivers are stationed in the end zone. The defense gets one defender, also in the end zone. The receivers cannot leave the end zone and, in the name of safety, the defensive player cannot play the body before he plays the ball. Bombs away. A reception nets the offense a point. Otherwise, the scoring team’s touchdown is only worth six. The extra Hail Mary may be a bizarre idea. But it would never be called boring, easy, or predictable. Remember that when you’re choking down truckload after truckload of pro-football parsley.